Our experts learn your objectives and become your partner in communication essential KPIs. Targets from Excel and actuals from your live system combine effortlessly. Connecting and mix together data from many sources. Easy and automatically data connections. Fast and very powerful cloud reporting application that delivers answers to managers. What is a Multi-Row Spanning Item? 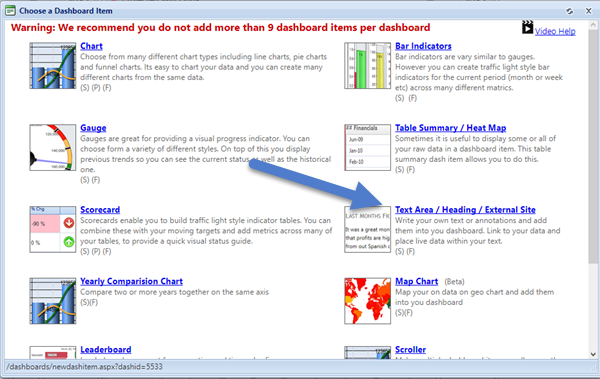 While Target Dashboard has a number of dashboard layouts that fit just about any occasion, there are some times when it would be ideal to have a dashboard item that spans 2 rows. It&apos;s 1 column wide, but 2 rows tall. Step 1: Make room on your dashboard for where the 2 row item will be located, then pick Add Other Item. 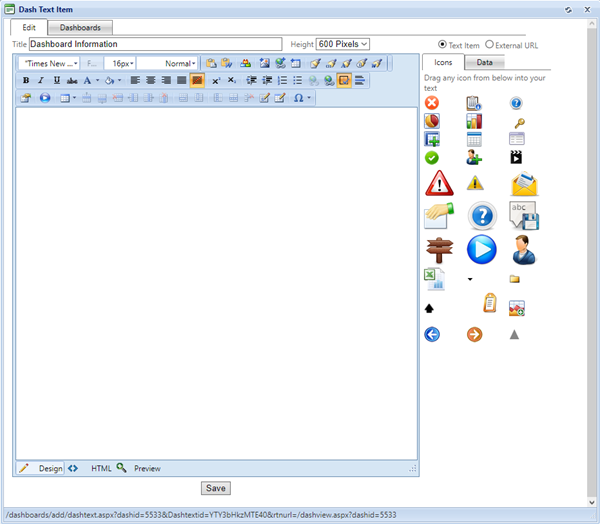 Step 2: Select Text Area / Heading / External Site. Step 3: Edit the title, set Height to 600 Pixels and add your rich text content, or click on External URL and have the webpage content embedded in your dashboard. 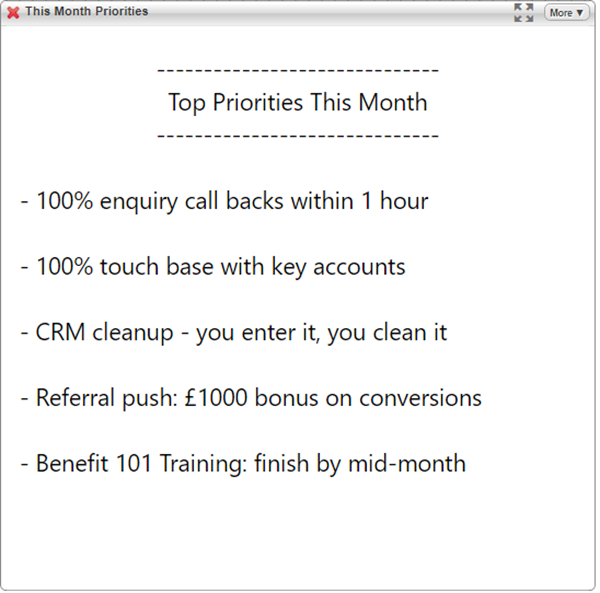 Step 4: Here&apos;s one simplistic example of how the formatted text might look - a to-do list. A multi-row spanning item takes just a few seconds to add, and gives you the capability of personalising the content of the dashboard for individuals, teams or departments. Who are Target Dashboard ? "When the message is clearer the decisions are better"
Copyright © 2009-2017 Target Applications Ltd. All rights reserved.